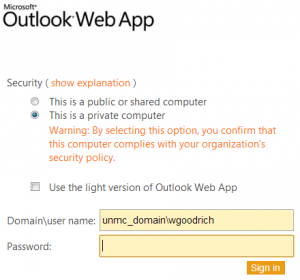 Logging into the email system from off campus or using the guest wireless network. Just a little more info here on what you will see if you use the email system in this manner. 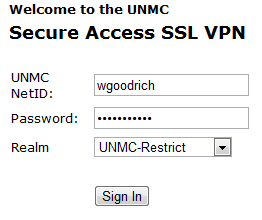 The link to log in is https://secure.unmc.edu/unmc and although it seems contradictory this is one place you don’t need UNMC_DOMAIN in front of your name to log in. Once you’ve filled in your username and password and picked UNMC-Restrict from the pull down menu, sign in. You’ll get a screen that looks a lot like this one. You can see there’s a link to go to the mail system and you shouldn’t even have to log in a second time to get there. After that it should look and behave the same way as the OWA does from on campus.